Truth be told, prior to SF telling me about these small berry-like fruits, I had no idea about their existence. A quick google landed me some answers to these curious looking things. Manjack berries are harvested from a tropical species Cordia dichotoma whose distribution spans from subcontinental India all the way to the southern coastal regions of China. It can also be found in Malaysia purportedly and one tree had been “uncovered” in Singapore a couple of years ago, planted in the backyard of a small Buddhist temple some 30 years back. This got me very curious, on how such a common fruiting tree would have gone unnoticed all these years. In Taiwan, they are planted as wayside trees which flanked both sides of streets, especially in central and southern Taiwan. Come fruiting season, all the womenfolk in the villages and small towns would come together to harvest the fruits and pickle them for months to enjoy ahead. 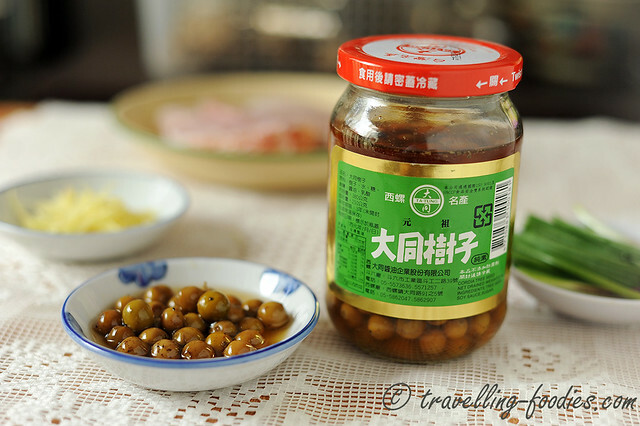 During our most recent trip to Taiwan, I see to it that I must get myself a bottle of pickled 破布子 amongst the honeys, soya sauce and whatnots of course. In Teochew cuisine, pickled plums are commonly used in steaming fish which leads much of its flavour to the meat, so strong that it is often used as the sole condiment. Well, pickled 破布子 taste somewhat similar, also a melange of savory and tangy hues with slight fruity overtones, but much more subtle than what pickled plums are like. It also has an interesting flavour which reminds one of olives! 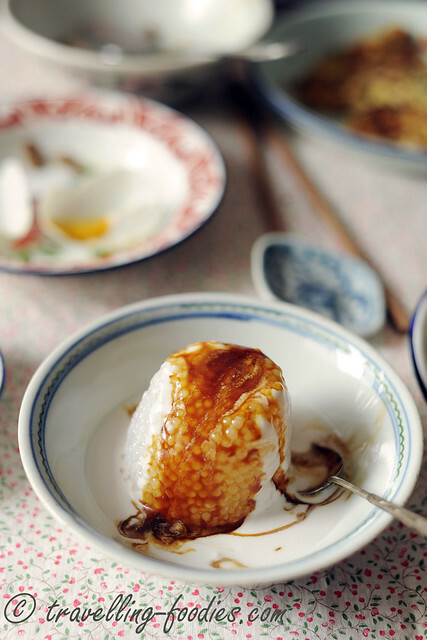 The way to incorporate 破布子 into your steamed fish is just like how one would just sour plums. Make sure your fish is uber fresh and with some julienned ginger and a good drizzling of the pickling liquids, the fish is ready for a sauna! If you like a bit of “kiam kiam” and a bit of “sng sng” in your steam fish then do try to get a bottle of these the next time you visit Taiwan. 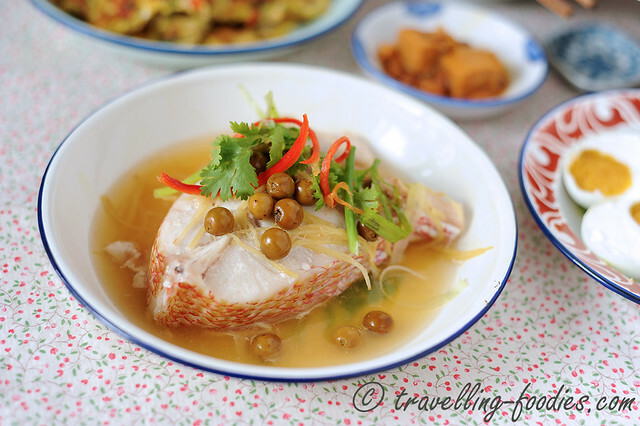 Steamed fish with pickled manjack berries goes very well with porridge and other side dishes. I like the flavours which it imparts unto the fish, moreish without being too heavy handed. One thick slab of meaty fish which is good for steaming. Red or White Snapper, Threadfin or Garoupa are excellent choices. Place the steak of fish onto a steaming dish and place some julienned old ginger both on top and beneath the fish. 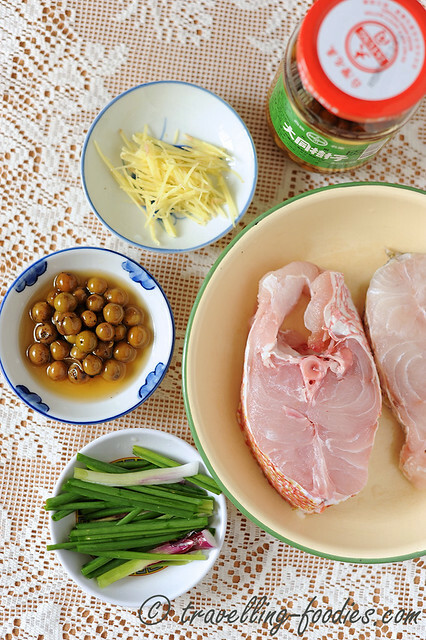 Ladle a spoonful of 破布子 over the fish and drizzle some of the pickling liquids over it. When the water in the steamer has come to a rolling boil, place the steaming dish into the steamer and steam at high heat for 12-15 min, depending on the thickness of the fish. After the fish is cooked, remove from steamer and garnish with red chilies, coriander leaves and spring onions. 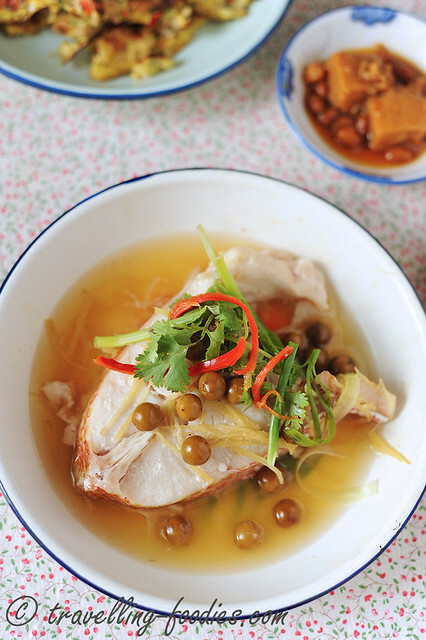 Serve immediately with an assortment of dishes that go well with chinese porridge. 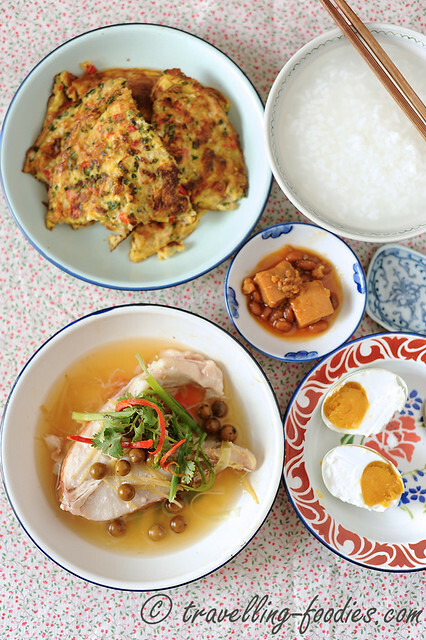 My favorites are chai por neng (pickled white radish omelette), kiam neng (salted eggs) and dau joo (fermented beancurd cubes), all of which you can see in one of the photos above! This entry was posted on April 23, 2015 by Alan (travellingfoodies). It was filed under Food, Simple Eats and was tagged with cordia dicordata, coriander leaves, 破布子, ginger, ikan kukus, red snapper, spring onions, steamed fish, taiwanese, threadfin, white snapper, 树子.